Dry shampoo is a type of shampoo used to reduce hair greasiness without the need for water. It is a powdered cosmetic product commonly sold in the form of either an aerosol spray or a powder shaker, depending upon the formula. The first commercially manufactured dry shampoo was sold in the 1940s, but dry shampoo existed for centuries before then. By the early 1940s, the Stephanie Brooke Company of Jersey City, New Jersey had developed, Minipoo, the first brand of commercially produced dry shampoo powder. Minipoo was marketed to women and children for use in scenarios such as "surprise dates" or when bedridden, according to the Smithsonian's National Museum of American History. Many early formulas contained fuller’s earth, an absorbent, naturally occurring substance often found in cat litter. Earlier history indicates the use of clay in ancient Asian hair treatments and the use of powdered shampoos in wig coloring and care during the Victorian era. In general, there are differing views regarding the regular use of shampoo. Some hair care professionals argue that daily wash-and-rinse with detergent shampoo can strip away natural oil from hair while subjecting users to potentially controversial surfactants and preservatives. Others claim that spraying dry shampoo every day leads to a build-up of product that can dull hair color and irritate the scalp; arguing that the scalp needs regular cleansing and exfoliation to get rid of bacteria, slough dead skin cells, and stay healthy. According to Mintel, regular shampoo usage has seen a slight decline, as 85% (2016) of those polled indicated they wash their hair less often, compared to 89% just a year earlier (2015). In addition to washing their hair less frequently, consumers are also purchasing more dry shampoos, with usage increasing by 4% in 2016. The increase in the use of dry shampoo is attributed to an updated marketing message positioning dry shampoos as time-savers while also promoting the volumizing effect as a styling aid. Additionally, many versions feature numerous free-from claims touting more natural ingredients without controversial surfactants or preservatives. Most commercial dry shampoo formulations consist of a propellant (butane, isobutane, propane, alcohol), an absorbent (aluminum starch, rice starch, silica) and an aromatic component (fragrance or essential oil). Due to the rise in popularity of dry shampoo as an alternative to traditional washing, numerous formulations that eschew propellants now exist in the market giving consumers a plethora of aerosol-free options. Dry shampoo formulas function to absorb hair’s superficial oily sebum, making hair look and smell fresh and matte. For best results, apply dry shampoo to scalp and work into hair roots, then wait several minutes before brushing. Allowing the absorbent powders to work their magic, undisturbed, removes any excess oil. 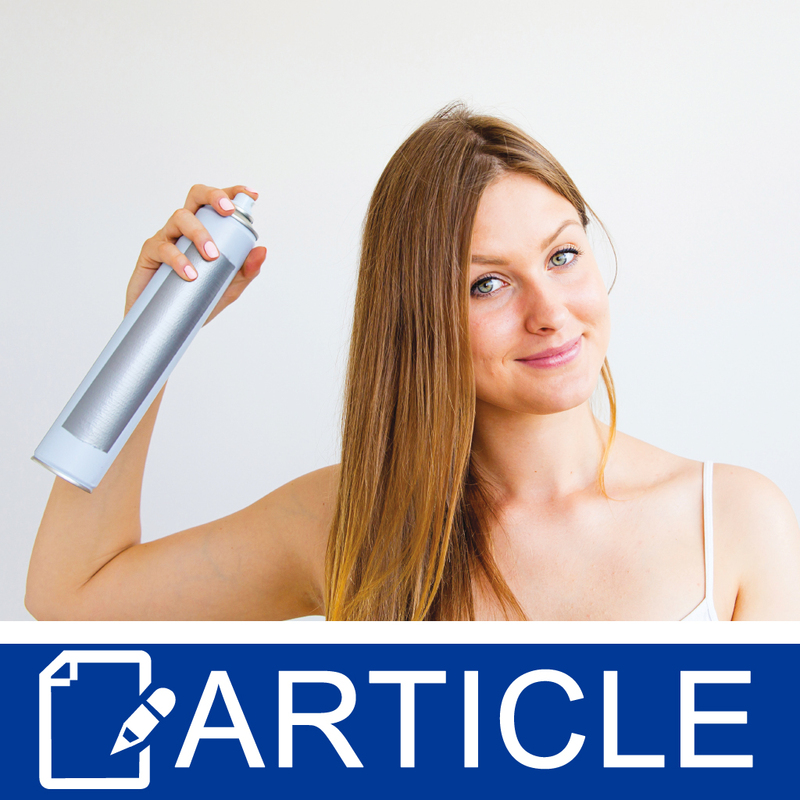 Overuse of aerosol sprays can clog hair follicles and disrupt the balance of a healthy scalp, although this can also be an issue with non-aerosol versions without propellants. Over-reliance on starch and silica-based formulas can also cause damage as they can wear away at the surface of the hair shaft, causing premature breakage and split ends. The grittiness of the starch and silica physically wears away the surface of the hair shaft. The numerous benefits to dry shampoo cannot be ignored. If you need a quick refresh before a night out or after a workout and don’t have time to shower, dry shampoo can be a quick and temporary solution. Dry shampoo is also an excellent option for those who are bedridden or have neck injuries making frequent, traditional shampooing difficult. When traveling or in a situation where fresh water may not be an option such as camping or visiting the International Space Station , dry shampoo can be an easy way to freshen up until traditional cleansing is an option. Other features and benefits of waterless shampoo include the reduction of color-fade, avoidance of controversial chemicals, water-conservation and the obvious time-saving benefits. The takeaway here is that dry shampoo is not a long-term solution, it’s a temporary fix. The origin of the powder component used in the production of dry shampoo can be mineral, organic or synthetic; derived from wheat, potato, rice, corn or other starch derivatives. However, the styling properties of dry shampoos, such as adding volume or lift, is limited. These powders are also not easily removed from the scalp, which can cause discomfort, irritation, and malodor with prolonged use. Just like traditional shampoo formulations, dry shampoo can be tailored to fit the needs of most hair types. From curly hair formulations containing Abyssinian Oil or Broccoli Seed Oil for frizz-prevention to fine hair formulations utilizing volcanic ash instead of heavier starches, there are options available to formulate unique options for every hair type. The only limit is your imagination.